Esther's first large quilt � a 9 Patch single bed quilt She lives a 30-minute walk away, way up in the mountains and comes to class twice a week. Since that first meeting, we have met at least twice weekly, sometimes three and four times a week to meet deadlines imposed upon them due to their creative quilting. We have our first mini-exhibition in three weeks and are working diligently to meet this deadline. Only three women have sewing machines in my little group of 20. Almost everything is done by hand. A few of the women knew how to sew in May. None knew a thing about quilting. They are learning and loving it. In the class Ana Uma�a learned to quilt for the first time ever and overcame her "I can't do this right" blues in spades! 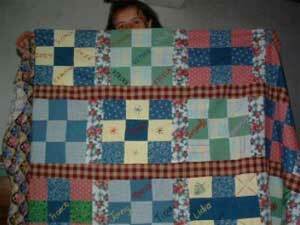 She quickly created over twenty 9 patch blocks by hand and then sashed them together for a bed quilt. Ana Uma�a's 9 Patch. 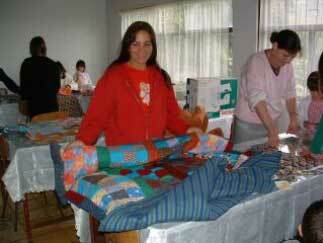 She embroidered the names of all the women and children in the quilting class. A friend of mine visited our home not long ago and saw some of the original blocks these women had quilted. She was so impressed that she said, �Put it all in a box for me, and I will take it all.� And, so, we had our first sale! I wish you could have seen the faces of these precious mountain women when I gave them each the money they had earned for their work. Oh, my! We/they even have a small bank account now. Kattia and her baby boy Kattia is the new woman to Rancho Redondo and said upon presenting her quilt to us, "I felt so alone here until this class, and now I am happy and have friends!" She has emerged as a teacher/helper. She has sewn for years but never quilted until now. Her talents are amazing. The women of my little pueblo are very, very poor in the economic sense. They could not/would not be quilting at all if it weren�t for the help and support of the Siouxland Quilters Guild and Mrs. Tomme Fent! Thank you, ladies. These women in North America heard about the economically deprived women in and around the Central Valley of Costa Rica and sent us threads, materials, patterns, trims, buttons, scissors, etc. Their gifts have been distributed to seven various groups within the country. Without the support of our North American fellow quilters, we wouldn�t be quilting with the wonderful fabrics that we are using. In October 2005, our quilts will be displayed in The Shapes and Colors of Costa Rica special exhibition at the "Siouxland Samplers 9th Biennial", Sioux City Convention Center in Sioux City, Iowa. There is a large Hispanic population in Sioux City and the guild wants to show our quilts to encourage the Latina community to learn to quilt. Carolyn Lee and I could tell you stories upon stories about what has been accomplished in the three short years since then. Perhaps, one of these days, we will! Carolyn Collins Underwood has been living in Rancho Redondo, Costa Rica with her husband Ed for the last 13 years.